Tips on choosing the right type of tattoo design for you. Now that you’ve decided to get your first tattoo design, you need to decide whether you want a coloured design or a black and grey design. Both have their own advantages and drawbacks, and either option will completely transform the final look of your tattoo. 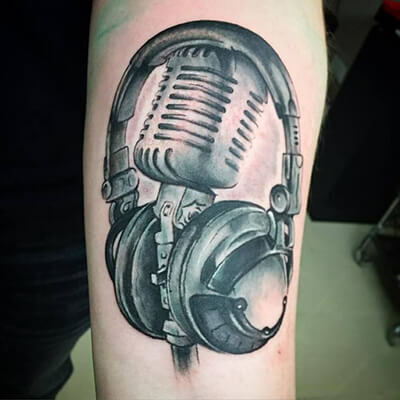 Whether you choose to get a black or color tattoo not only influences the way your tattoo looks, but it affects how your tattoo will last over time and what kind of designs you can get in the future. Black and grey tattoo designs fade significantly less over time. This means that your design will stay fresh-looking for longer, and that you’ll need fewer touch-ups. These designs are also classic: they’re more versatile, and it’s less likely that you’ll grow out of the shade as you mature. Black and grey tattoos cost less, they take less time, and they’re not as affected by the sun. These dark ink shades are easier to see on darker skin tones, and they won’t clash with any of your clothes. Color tattoo designs really make a statement, and a bright one at that. It’s important when choosing colors that you select ones which complement your skin tone. If you’re interested in learning more about which colours best suit your unique skin tone, check out our blog post, Which Colors Work Best for Tattoos. Sun worshippers should steer clear of coloured tattoos or make sure to apply sunscreen over them, so that your colour doesn’t fade. From a creative standpoint, color tattoos allow more room for artistic expression, and they’re better for covering existing tattoos. Start the process today by contacting Custom Tattoo Design: we have a team of talented professional artists who will work with you one-on-one until you get the tattoo design you have always dreamed of– be it in color, or black and grey!